Great location right next the slopes, friendly staff and excellent communication via email before arrival. Recently stayed here for 4 friends for a skiing trip in 1 apartment. Apartments are clean and have everything that is required. Location is excellent for access to the slopes and ski lockers are provided for gear. Price of the apartments is extremely reasonable. They also accommodated us with a late check out which was very much appreciated. Close to slopes. Ski locker included in the room rate. Great bars and restaurants nearby and a supermarket next door. Very close to the main slope. Basic but great for groups. Staff were excellent. The hosts were excellent organised all of our ski passes and ski rental and had it waiting at reception! They couldn’t have been more helpful! Excellent location warm basic room with nice view over the slopes. Good ski storage. Helpful staff. As mentioned above and below, location of this property is excellent in terms of location to lifts, ski rentals, shops etc. We had booked 2 rooms for 8 people and due to not being filled we were moved together which lead to a larger room for the second group - very much appreciated. All staff all very helpful with general queries, ski lift passes available at reception for ski-by-dayers. Budget rooms were to a very good standard for price range. Muchas Gracias! The view over the slopes and very very close to the slopes. Exellent !!!! Frontera Blanca This rating is a reflection of how the property compares to the industry standard when it comes to price, facilities and services available. It's based on a self-evaluation by the property. Use this rating to help choose your stay! One of our top picks in Pas de la Casa.Frontera Blanca is just 150 feet from the ski lifts of Grand Valira, the Pyrenees’ largest ski resort. It offers ski equipment rental and studios with a private balcony and satellite TV. The studios at Frontera Blanca feature tiled floors and simple wooden furniture. Each one includes a kitchenette with a stove, microwave, toaster and teakettle. The hotel offers a ski school, as well as organizing 4x4 or hiking trips. It also has lockers to store ski equipment. Massages are available for a fee. The hotel is in Pas de la Casa, on the French border and 45 minutes’ drive from Andorra La Vella. La Seu d’Urgell is 1 hour and 15 minutes drive away. When would you like to stay at Frontera Blanca? This studio features a private balcony and a flat-screen TV. It has a bedroom with bunk beds and a sofa bed in the living room. The kitchenette includes a dishwasher, ceramic hob, microwave, toaster and kettle. The bathroom comes with a bath tub and there is a separate toilet. Bed linen and towels are provided. This studio features a private balcony and a flat-screen TV. It has a bedroom with bunk beds for 4 people and a sofa bed in the living room. The kitchenette includes a dishwasher, ceramic hob, microwave, toaster and kettle. Bed linen and towels are provided. The bathroom comes with a bath tub and there is a separate toilet. This studio features a private balcony and a flat-screen TV. It has a bedroom with bunk beds and 2 sofa beds in the living room. The kitchenette includes a dishwasher, ceramic hob, microwave, toaster and kettle. Bed linen and towels are provided. The bathroom comes with a bath tub and there is a separate toilet. 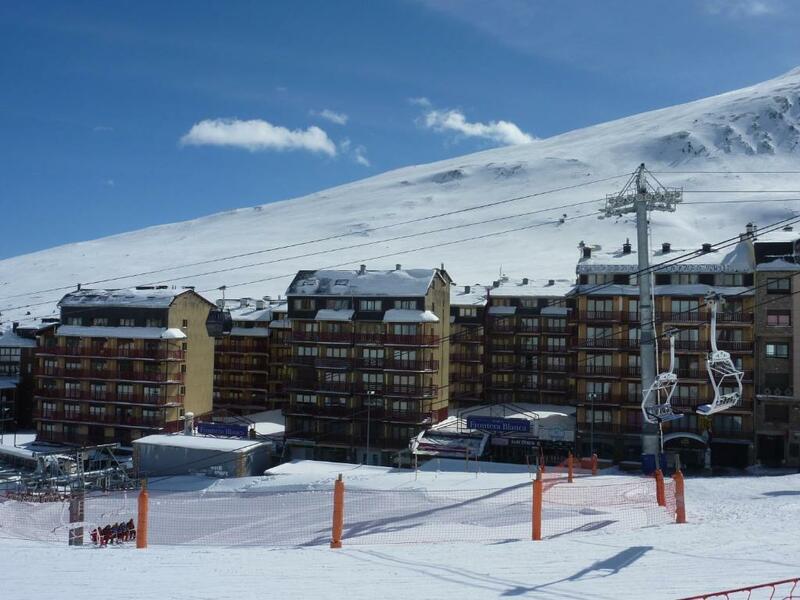 FRONTERA BLANCA constitue le plus grand ensemble de studios, parkings d'Andorre au pied des pistes en première ligne de la station GRANDVALIRA, secteur PAS DE LA CASE. Résidence classée 2/3 étoiles en 2006 par le Ministère de Tourisme. Sa situation, sa capacité d'accueil en font une référence pour tout ce secteur d'activité notamment grâce à l'implication de la directrice élue présidente de la copropriété et grâce à son action comme présidente de l'Association des Appartements Touristiques d'Andorre. Nous parions sur l'amélioration constante, pour cette nouvelle saison, nous avons changé tous les casiers à skis et amélioré notre système wi-fi. Le personnel de l’Agence Frontera Blanca s’attachent à sélectionner des locations de vacances au Pas de La Case qui bénéficient d’un emplacement exceptionnel à quelques dizaines de mètres des pistes, et à proximité des commerces. Situés dans le haut de la station de ski, à l’abri du centre ville très fréquenté pendant les périodes des vacances, les appartements au pied des pistes bénéficient d’une situation au calme. Au fil des années, l’Agence Frontera Blanca n’a eu de cesse de proposer de nombreux services complémentaires à ses clients. Depuis plus de 30 ans, chacun profite ainsi dans les meilleures conditions des emplacements “au pied des pistes“ de l’ensemble de ces locations de vacances situées au Pas de La Case. Pour autant, Frontera Blanca se trouvent qu’à quelques centaines de mètres des commerces et des animations. Exceptionnelles, notre résidence Frontera Blanca est située en face du télésiège 6 places Font Negre de Grandvalira / Pas de La Case. House Rules Frontera Blanca takes special requests – add in the next step! Frontera Blanca accepts these cards and reserves the right to temporarily hold an amount prior to arrival. Guests arriving outside of front desk hours can check-in using the hotel's check-in machine. To receive the password, please contact the hotel prior to arrival using the contact details found on the Reservation Confirmation. Please inform Frontera Blanca of your expected arrival time in advance. You can use the Special Requests box when booking, or contact the property directly using the contact details in your confirmation. You have to clean the apartment before leaving. There is an option for a clean to be provided but there is a surcharge on this. Rooms dated .bedding and sofa beds grotty . The apartment could do with a spruce up but great value for money. Fantastic location and very helpful staff. Night security were so kind and helpful. Really helped us out when our friend was in hospital. Thank you! Very noisy apartment block, despite having a quiet policy from 10pm to 8am we were woken continuosly between 10pm and 3am by drunken idiots shouting up and down the stairwells banging doors and being generally inconsiderate. Recommend you ask for a room away from lift and stairwell if you want any sleep. Also need to indicate on booking confirmation where to pick up keys. The bathroom door handle broke in one room which kept us locked out of the bathroom - however this was resolved quickly and was replaced the same day. Reception closes during lunch hours leading to a small delay at check in. We were not told about apartment review on check-out so when we went to check-out we were delayed by a further half an hour and nearly missed our bus as a result! The main fuse for the apartment electricity kept tripping.